With a key location on the inner ring, road, on site residents and the best parking in Coventry, Belgrade Plaza makes an attractive choice for brands to locate for both the long and short term. Enquire about our space to let and commercialisation opportunities. Belgrade Plaza is a hub of activity located within a 2 minute walk of Coventry city centre. Located just off the ring road, the Plaza benefits from high levels of passing traffic, as well as being adjacent to several bus stops. Home to Coventry’s largest car park, Belgrade Plaza is also the main choice for visitors shopping in the city centre, providing a accessible link into the city. 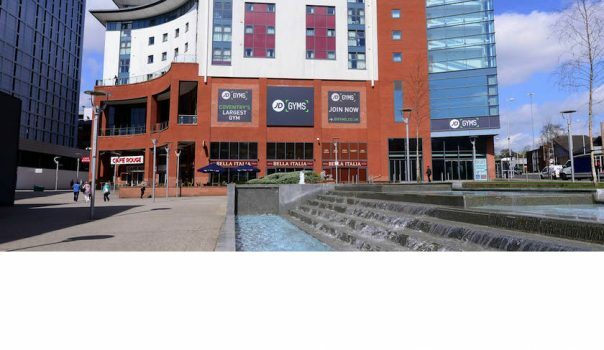 With several well-known restaurants, JD Gyms and Belgrade Theatre located on-site, the Plaza provides a great opportunity for you to promote your brand within a bustling area within Coventry City Centre. The Plaza is also home to 600 students who live in student residences at City Village, and 64 one & two bed furnished apartments at Strava House Belgrade Plaza, meaning that the area not only buzzes with activity on the weekends, but throughout weekdays too. Belgrade Plaza has a track record of major brands using the plaza for promotional space, including Amazon. Due to popular demand, the Amazon Treasure Truck has visited the Plaza several times over 2018. This has proven to be a major footfall driver for the Plaza. The site is able to cater towards the needs of your brand, with power readily available on-site. There is also a choice between a grassed or concrete area to set up your space, depending on what works best for you. 4,506 SQ FT Unit Available Now!